I rewired this light fixture I picked up from an thrift store. I payed $5 (i think) for it. I make the cord really long so I could hang it from the ceiling in my craft room. Well, when we moved, the bedrooms did not have lights in the ceiling. We had to plug something in. Tada! I had a light for my son's room. It did not have globes that I liked. I refused to put the old wierd ones back on it. I found these glass jars with a flur de leis on it (which is the symbol for Scouts)and used them as the globes. I really like how it turned out. Yeah, I'd say! I really liked how it turned out, too! 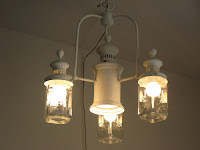 How did you attach those jars to the fixture?